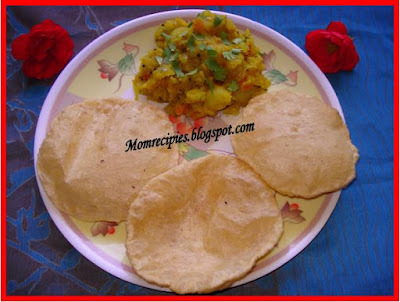 Poori Bhaji is a very famous dish that can be found on almost all festive occasions. Be it a puja, party, picnic, family gathering or a holiday afternoon, poori bhaji marks its presence on each and every occasion. It is the popular Indian meal served with spicy potato vegetable. Poori bhaji is the best of all Indian take-aways, on journeys, picnics etc.It is a great meal at breakfast or brunch or lunch.It is not only very delicious, but also quite simple to make.No one can resist the temptation of eating tasty poori bhaji.The dish is a hit with children and adults alike and very easy to come up with, when guests pop in suddenly. Mix all the ingredients in a large bowl. Add warm water little by little to make a smooth but *firm* dough (firmer than regular roti dough). Let the dough relax for 30 minutes in the covered bowl. Then take about a tablespoon of dough at a time, roll it into a thin circle (using some more atta to help in the rolling process),Heat oil in wok / Kadai and when it is hot,slide one poori in from the side.Press down with the slotted spoon to allow it rise completey and then turn over and cook the otherside until the poori is puffed and golden on both sides. Drain well on some paper towels and serve hot. Serve the poori hot with pindi choley or Aloo Bhaji or Shrikhand . Do not roll it out too thin. When u prepare batter for poori, add a pinch of sugar along with the salt in the flour. You will get puffy pooris. 1) Heat oil in a pan, put the mustard seeds and cumin seeds and allow it to splutter. 2) Add the chopped onions and sauté it till it becomes golden brown. 3) Add the curry leaves, ginger- garlic paste,and chilly paste ,Hing and fry it for a minute. 4) Add tomatoes and cover the pan till the juice makes a paste of the mixture. 5) Peel the potatoes and crush them with hand and add to the mixture. 6) Add salt and turmeric . 7) Add water and let it simmer on low heat for 5-10 minutes..
8) Transfer to bowl, garnish with chopped coriander leaves. 9) Serve hot with pooris. 1) Poori bhaji also goes well with shrikhand or flavored fruit or plain yogurt and definitely some hot, spice tea. 2) Instead of poori, you can serve the Bhaji with bread too. 3) Poori can aso be served with with pindi choley. I love pooris! Yours look wonderful!! The potato side sounds so flavorful. Fluffy poori looks yummy, send me that plate, am hungry now..
wow fluffy poori.Never knew the tip of adding a little bit sugar to the flour to get fluffy pooris.Will try when i make next time.Bhaji is tempting. Very tempting picture of the poori! Looks great! 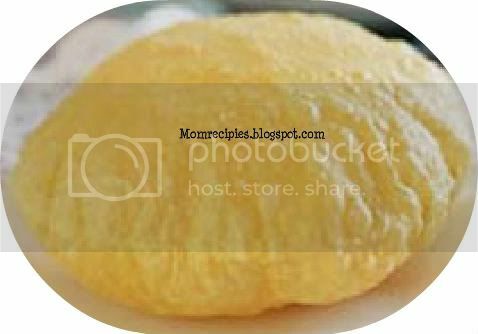 Wow that puri has really puffed up. Delicous. Poori looks great! Do check Dubai Palm islands tour in my World food treat blog..! 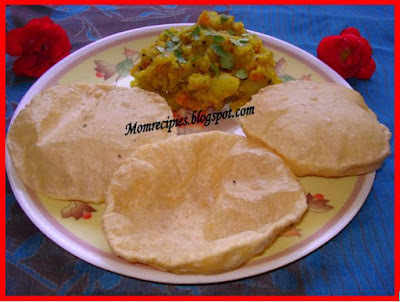 i love that picture of puffed poori..looks yumm..
Wow Poori with potato, its a yummy combo. Looks delicious. This is the bessttt puri bhaji recipe ever! !